An In-Depth, Digital Rendering of Sting's Solo Career Featuring Exclusive All-Star Performances From His 60th Birthday Concert at New York City's Beacon Theatre. Sting, in partnership with global transmedia company @radical.media, has launched STING 25. The expansive, dynamic app for iPad explores the life, music and activism of one of the world's most influential musicians. With unparalleled access to seminal performances, rare photos and personal stories, the comprehensive app depicts the past 25 years of Sting's career as a renowned musician and humanitarian. "This 'appumentary' harnesses the display and Multi-Touch capabilities of iPad to tell a much richer story than you could using a single medium," said Justin Wilkes, the app's Executive Producer. "The narrative behind Sting's journey as a songwriter and a solo artist is as layered as this app, which is why he was the perfect subject to collaborate with for this new approach to storytelling." The ‘appumentary' explores Sting's solo career, guiding users through the influences that have shaped his music, as well as his ongoing efforts as a global citizen and activist. The many facets of his career come to life through handwritten lyrics and journal entries, rare and intimate photos, in-depth interviews, and a variety of live concert footage, including exclusive all-star performances from his Sixtieth Birthday Celebration to benefit the Robin Hood Foundation at New York City's Beacon Theatre. The idea for the app emerged as Sting compiled material from his diverse 25 year solo career for the recently released box set collection, Sting: 25 Years. The concept evolved while exploring innovative ways to celebrate both the anniversary of his solo career and his 60th birthday, while simultaneously integrating emerging technology. "I felt like an archaeologist in a way, going through years and years of material, excavating these pieces of history, to put together the box set. We initially considered some sort of documentary, but the idea developed into something much more compelling and dynamic," said Sting. "This app encompasses my entire solo career. It's a scrapbook for the digital age." - Exclusive concert footage and behind-the-scenes access from Sting's Sixtieth Birthday Celebration to benefit the Robin Hood Foundation, at New York City's Beacon Theatre, featuring performances by: Bruce Springsteen, Lady Gaga, Stevie Wonder, Rufus Wainwright, Herbie Hancock and Branford Marsalis. - Hours of concert footage, exclusive interviews, photos, music videos, and more in ten chronological chapters. - The inspirations, collaborations, and charitable endeavors that have shaped Sting's 25 year solo career. - Sting's signature instruments, through 360˚ views and high definition zoom images. The STING 25 App offers a truly integrated experience. Using AirPlay, users can stream all of the performances wirelessly on their HD TV using Apple TV while exploring additional content on their iPad. Additionally, the app offers Sting's music catalog so users can preview music with the option to purchase directly from the iTunes Store or listen to the tracks they already own. The STING 25 App is available for free from the App Store on iPad or at www.itunes.com/appstore. The STING 25 App is brought to users for free through the generous support of American Express. 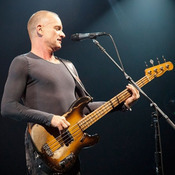 American Express is a proud, longtime partner of Sting, including its support of his Sixtieth Birthday Celebration to benefit the Robin Hood Foundation and his current tour, Back to Bass. Initiatives such as this dynamic, first-of-its-kind app are examples of the company's strong commitment to bringing its Cardmembers and all fans unique music content and experiences. @radical.media is a global transmedia company that creates some of the world's most innovative content across all forms of media. The company develops, produces and distributes television, feature films, commercials, music programming, smartphone & tablet applications, digital content and design. @radical.media has produced a number of award-winning projects, including the Academy Award®-winning documentary "The Fog of War;" the Grammy Award-winning "Concert for George;" the Independent Spirit Award-winning "Metallica: Some Kind of Monster;" the pilot episode of the Emmy® and Golden Globe winning series "Mad Men;" the Emmy-winning "10 Days That Unexpectedly Changed America" for the History Channel; five seasons of the critically acclaimed series "Iconoclasts" for the Sundance Channel; the premiere seasons of "Oprah Presents: Master Class" and "Visionaries" for OWN; and recently, the MTV documentary "Lady Gaga: Inside the Outside." Additionally, the company has garnered numerous accolades for digital initiatives such as "The Johnny Cash Project," "Arcade Fire's Wilderness Downtown" and the Gagosian Gallery's App for iPad. Composer, singer, author, actor, activist – Sting has won universal acclaim in all of these roles yet he defies easy labeling. In 1977, Sting formed The Police with Stewart Copeland and Andy Summers. The band released five albums and in 2003 was inducted into The Rock and Roll Hall of Fame. With the release of "The Dream Of The Blue Turtles" in 1985, followed by "Bring On The Night", "…Nothing Like The Sun", "The Soul Cages", "Ten Summoner's Tales", "Mercury Falling", "Brand New Day", "All This Time", "Sacred Love", "Songs From The Labyrinth", "If On A Winter's Night…", and "Symphonicities", Sting has evolved into one of the world's most distinctive and highly respected performers. To commemorate the 25thanniversary of his solo career, the definitive box set "Sting: 25 Years", containing three CD's, a live concert DVD, plus a hardcover book featuring rare photos, complete lyrics and much more, was released on September 27, 2011. "Sting: The Best Of 25 Years" is also available. Sting has sold nearly 100 million albums and earned a total of 16 Grammy awards from his combined work with The Police and as a solo artist. Also an accomplished author, Sting published a memoir entitled "Broken Music" in 2003, which spent 13 weeks on the New York Times Best Sellers list. He most recently released "Lyrics", a comprehensive collection of lyrics and personal commentary, also featuring photographs from throughout his career. Sting's support for human rights organizations such as Amnesty International and the Rainforest Fund, which he co-founded with his wife Trudie Styler in 1989, mirrors his art in universal outreach. Yes I want the footage of the Birthday Bash, I was there! But to only make it available on the iPad is not fair. Make it available on the iPod Touch and iPhone would be a better bet for people to get "something for free"! "Last time Sting played South Florida, in July 2010 at the Cruzan Amphitheatre in West Palm Beach, he was backed by the 50-piece Royal Philharmonic Concert Orchestra, and it was great. No, it was breathtakingly magnificent, actually. But on Saturday night at a sold-out Fillmore Miami Beach, the frontman for The Police proved he's just as mesmerizing with a mere five-piece backing band.Clad humbly in a tight gray T and jeans - and hair cropped so close he was nearly bald - Sting (on bass, for a welcome change) started the night with the country-tinged 'All This Time', powered by acoustic guitar, mandolin, and sultry backup singer Jo Lawry. The crowd then exploded when the band kicked into 'Every Little Thing She Does Is Magic', during which Sting - who recently turned 60, but looks more like 40 - absolutely nailed every high note. And the band didn't miss the keyboards from the studio version one bit..." Click here to read in full what the Miami Herald had to say about Sting's concert at the Fillmore Miami Beach. Were you there? Share your review or comments and post any photos from the evening or your ticket stub to the event page. Tell us about it!